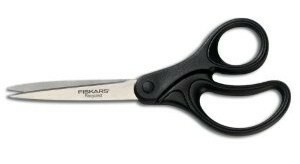 I randomly came across these Fiskars Recycled Scissors on Amazon today and the only thing that caught my attention was the rating. It has an awesome one, 4.7 out of 5 from 55 reviews. I know a lot of you are coupon clippers so thought this was a good deal to mention! You can get them for $2.68 shipped on a $25+ order, or for $3.99 including shipping. NOTE: I also found these Scotch scissors. They cost a few more dollars ($8.12), but have a rating just as good as the ones above but with many more reviews (252 instead of 55).